Over the next several months and right up until the day before the semi-finals, women all over the country were competing to get that golden ticket saying they could rope for chance at $100,000. Each girl could possibly qualify twice and many did, giving them an even better chance at the big bucks. Before the first calf was even ran our draw had 485 ropers ready to give their all. The semi-finals started Monday the 25th; each lady that qualified roped their first round calf that night and then the next morning they all ran their second round calf. The competition was big and the times just got faster and faster over those two days. Round one was won by Madison Milligan with a 1.7 seconds. And if you can believe it, round two was even faster, it was won with a 1.5! In the average Tanegai Zilverberg was the fastest on two head with a 4.05 leading into the round performances. They took the top 40 fastest ropers on two head. Those lucky ropers would get another chance to be blistering fast. Each one took their shots, some pushed the envelope and succeeded, while others fell a little short. From here they would take the top 16 fastest girls on one head. In the performances Larri D Guy was the fastest with a 2.02 heading into the long round at AT&T Stadium. 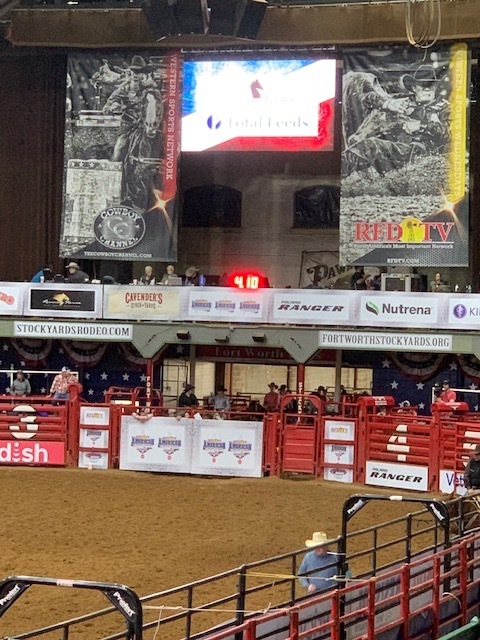 The long round at AT&T was great watching, dreams were made as they rode in under those big lights with thousands of fans watching. For some that dream continued into the long round of 8, Sawyer Gibert was the fastest with a 2.22. These top 8 woman fought hard and roped tough but in the end only the top four on two would make it to rope for $100,000. These four were Kelsie Chase (4.80), Jackie Crawford (5.44), Madison Outhier (5.48) and Taylor Munsell (5.54). The final round of four was finally here, and you could tell that each roper was going for it. It worked for some and others their dreams fell short. in the end Madison Outhier was our first ever RFD - TV American Breakaway winner with a 2.29. Taylor Munsell ended up second with a 2.62. To make things even more amazing for Madison she is only 16 and was a JR American qualifier. Boy, did she set the bar high for next year! February 25th - March 3rd 2019, will become dates in history that many will never forget. Women have reached new highs and grown in the sport of rodeo. They are blazing trails for many to come and setting examples for all those that never thought they could see this day. We all thank those involved with The American, those that sponsored us and those that helped fight to get this fantastic opportunity. We are so grateful and you can bet that we are here to stay and to grow even more as the years come.